A bunch of our readers preordered the Slide Wallet last year during its crowdfunding campaign, and now, the same team is back with the Slim Wallet. 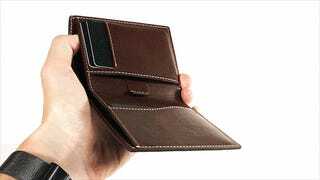 While it lacks the built-in money clip of the previous model, the calfskin leather Slim Wallet is still one of the few options out there that’s great at holding cash, cards, and coins, rather than focusing on just one. One the card front, you get five different slots for cards, all of which can hold multiple cards. One even has a pull-tab for quick access to your most-used cards without having to pinch a sliver of exposed plastic. The whole wallet is RFID-protected too, so you’ll have nothing to fear from skimmers. As for cash, the wallet can hold up to 20 bills of varying sizes, so no matter what country you’re in, the local currency will fit. And on the inside of the cash pocket, you’ll also find a small coin pouch with a leather flap to keep them from falling out. Coins are awful and should be outlawed, but until then, it’s great to see a wallet that considers where you’ll keep them. Preorders for the Slim Wallet have been selling for $89 on Indiegogo, but just for our readers, they’re offering a limited number of wallets for just $59. We sort through the noise of Indiegogo to find you preorder discounts worth taking advantage of. Someone on our team has tested a prototype (or final version) of every Indigogo we cover.